A top-secret program is tasked to replicate the original Weapon X experiment that bonded adamantium to the skeleton of Wolverine. The project is taken in a new direction: Dr. Martin Sutter recruits renowned mutant geneticist Dr. Sarah Kinney to develop a clone of Wolverine. Also on the team is Sutter's protege, Dr. Zander Rice, who was raised by Sutter after his father was killed by the original Weapon X. Since the only genetic sample from Weapon X is damaged, Kinney is unable to salvage the Y chromosome. Kinney proposes the creation of a female genetic twin. Her request is denied; Rice is opposed to the idea. After 22 failed attempts at reconstituting the DNA using a duplicate X chromosome, the 23rd sample yields a viable sample to combine with an embryo. Although Kinney is allowed to proceed, Rice exacts revenge for her insubordination by forcing her to act as the surrogate mother of the specimen. For nine months, Kinney's every move is monitored. Finally, she gives birth to "X-23". After seven years, Rice subjects X-23 to radiation poisoning in order to activate her mutant gene. He extracts her claws, coats them with adamantium, and reinserts them back into her hands and feet – a procedure performed without affording the child any anesthetic. Rice creates a "trigger scent" that drives X-23 into a murderous rage when she detects it. X-23 is then trained to be a hired assassin, ordered to kill "anyone ... everyone ... for a price." 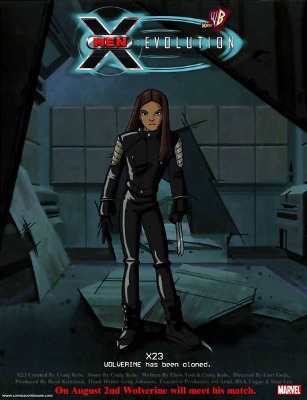 Kinney's niece Megan is abducted by a serial killer; she smuggles X-23 out of the facility to rescue her. X-23 tracks the abductor to his apartment, kills him, and frees Megan. Kinney is fired when she returns and is escorted off the base. Shortly thereafter, Rice assigns X-23 to eliminate Sutter and his family. He orders her to keep it secret. X-23 reveals to Sarah that Rice is responsible for the murders. Before Kinney leaves, Rice reveals a chamber containing the incubation pods for subjects X-24 through X-50. Kinney drafts a letter to her daughter, assigning her a final mission: destroy the pods and kill Rice. X-23 succeeds and meets her mother, and they prepare to flee. However, prior to his death, Rice exposed Kinney to the trigger scent. 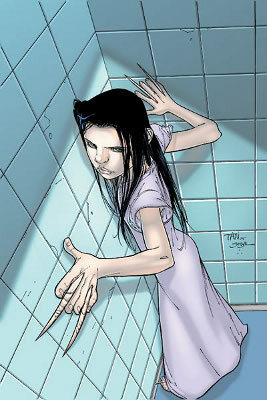 X-23 goes into a murderous frenzy and kills her mother. As she lies dying, Kinney tells X-23 that her name is Laura and that she loves her, and hands her the letter and pictures of Charles Xavier, Wolverine, and the Xavier Institute.